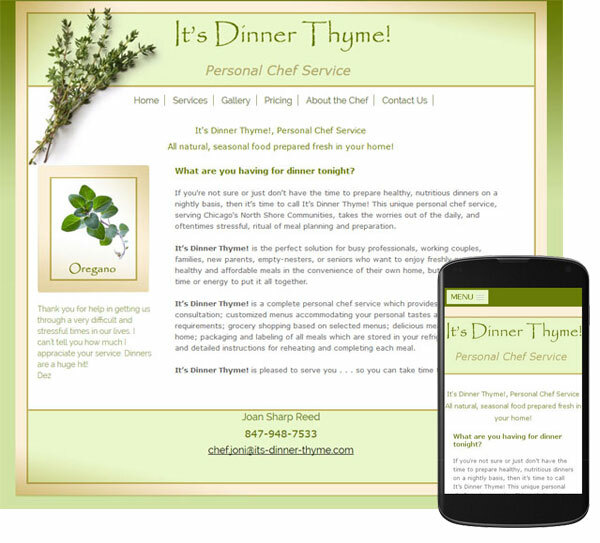 This site for It’s Dinner Thyme, a Chicago based personal chef, is another great example of how we can make just about any web site mobile friendly. Joan Reed approached us after having problems with another web design company, she was looking to convert the site she had into one that was mobile friendly and at a reasonable price! She was not looking for a completely redesign but just needed her site to function well on both desktop and mobile devices. Please know how grateful I am for your help in updating my website.